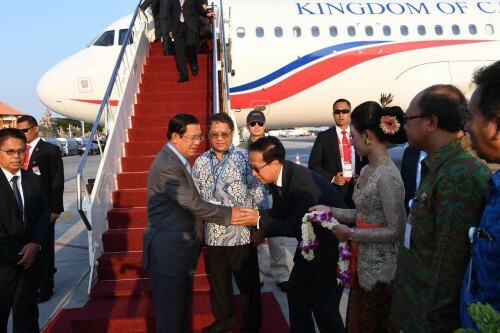 Head of the Royal Government of Cambodia, Samdech Techo Hun Sen, at 4 pm Wednesday (Phnom Penh time) arrived Bali, Indonesia safely to attend ASEAN Leaders’ Gathering to be held from 10-12 October 2018. Prime Minister Hun Sen and his senior delegation were warmly welcomed by Rudiantara, Indonesian Minister of Communications and Information Technology; Hor Nam Bora, Ambassador of Cambodia to the Republic of Indonesia, as well as various Indonesian and Cambodian diplomats. “Today, my delegation and I have traveled from Tokyo and arrived Bali, Indonesia after a 10-hour flight,” Samdech Techo Prime Minister Hun Sen wrote on Facebook. “As scheduled, we will be meeting with Heads of State/Government of ASEAN, United Nations Secretary General, World Bank Group President, Managing Director of International Monetary Fund, and other key persons focusing on economics,” he added. According to the premier, he will lead a delegation back home on the 12th. The ASEAN Leaders’ Gathering will be held under the theme “ Achieving SDGs and Overcoming Development Gap through Regional and Global Collaborative Actions” in conjunction with the Annual Meeting Plenary of the Board of Governors of International Monetary Fund (IMF) and World Bank Group (WBG). ​Samdech Techo has also been invited as a Special Honorary Guest at the Annual Meeting Plenary​ on 12 October by Mr. Petteri Orpo, Annual Meeting Chairman, Mrs. Christine Lagarde, Managing Director of the IMF and Mr. Jim Yong Kim, President of the World Bank Group, according to foreign affairs ministry’s press release dated on Monday. At the ASEAN Leaders’ Gathering, Prime Minister Hun Sen is scheduled to deliver key remarks on ASEAN’s economic resiliency, potential market, the fourth industrial revolution, the building of ASEAN Economic Community and Millennium Development Goals.